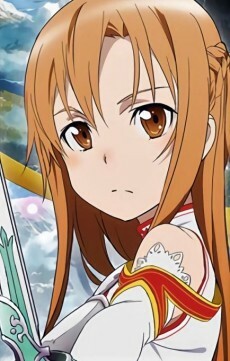 She is married to Kirito in SAO. They decided to have a peaceful life and decided to buy a house on the lower part of Aincrad and take a break from the guild Knights of the Blood. But later they need to return to the front lines and have to abandon their peaceful life. After the SAO incident, all the players that survived should have awoken, but Asuna is still trapped within her NerveGear. She is actually abducted by her betrothed, Sugou Naboyuki, who transfers her to ALO (Alfheim Online). In ALO, She is known as Queen Titania, yet she is only a character who is trapped within a cage that is programmed to be an unbreakable object.